Rolling To Tummy While Swaddled: This doesn’t necessarily mean your child is ready, but this is a big reason people stop swaddling–ready or not. A baby on her tummy without her hands available isn’t safe. Improved Motor Control: Most babies seem to be ready to drop the swaddle between 3-6 months old (but don’t live by that age range–that is most, not all). All babies develop fine and gross motor skills at an individual rate. Sleeping Habits: If your child is sleeping well and happily, you probably don’t need to push dropping the swaddle. If your child is sleeping fitfully, consider dropping it. This is especially true if your child was sleeping well and then suddenly starts not sleeping well. There are, of course, other reasons for poor sleep, but make this a consideration. Brinley showed no signs when I started her first arm out, but after a couple of weeks of that she started gettimg mad sometimes at nap time. It wasn’t a huge thing, but it was out of character. It wasn’t until I dropped the swaddle all together that she went back to happy. I think this is the perfect comment for us to remember. She is absolutely right. If your baby isn’t ready, so long as there is not a safety concern, you don’t need to push it. Your baby will be ready some day. 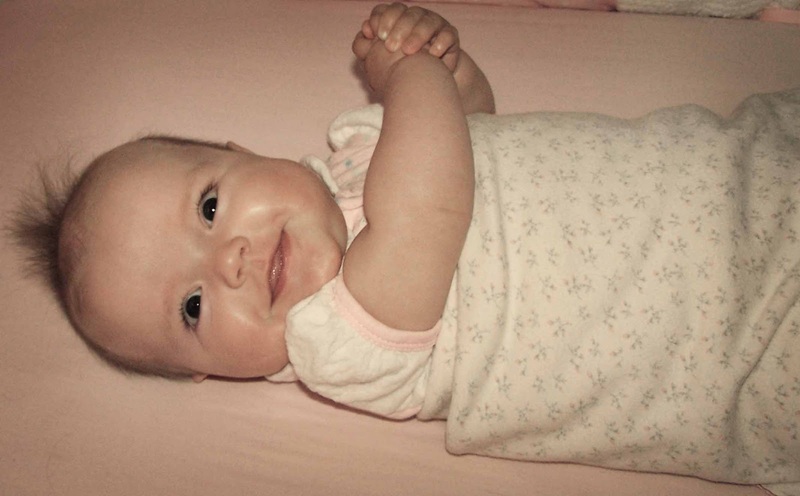 If you suspect your baby is ready to drop the swaddle, give it a try! If you try and it doesn’t go well, go back to swaddling. I always like to do my testing during the final nap of the day–so typically the third or fourth. This is often a “cat nap” (meaning it is 30-60 minutes long) and it is right before bedtime, so it isn’t going to throw the whole day off if things don’t go well. I am really a big fan of taking things slowly. I find taking things slowly with babies means you keep things as smooth as possible. Some people prefer to go “cold turkey” and have a rough week or so and then have it behind them. I don’t like rough weeks, but we all have different preferences and personalities so pick a method that rings true to you. The method you choose will also depend on your reason for dropping the swaddle. You might have a baby rolling over and need to go cold turkey because it is a safety issue. Maybe you have a time deadline and need to work within that time constraint. Whatever method you choose, absolutely feel free to tweak any method to work best with your baby and your family. This is the method I have used for all of my girls (Brayden was never swaddled). I start on the third (or last) nap with one arm out of the swaddle. If the nap goes well enough for my liking, we continue on with this for a week. The next week, I leave one arm out for the last two naps of the day. The test of this nap is that baby needs to make it through a transition (the 45-60 minute mark into the nap). With the final nap, baby doesn’t transition typically. I do this for a week, making sure baby can transition well with one arm out. I leave one arm out for night sleep. We do this for 3-7 days. By now, it has been about a month since we started one arm out. You see this is a long process! Next I move on to phase two. 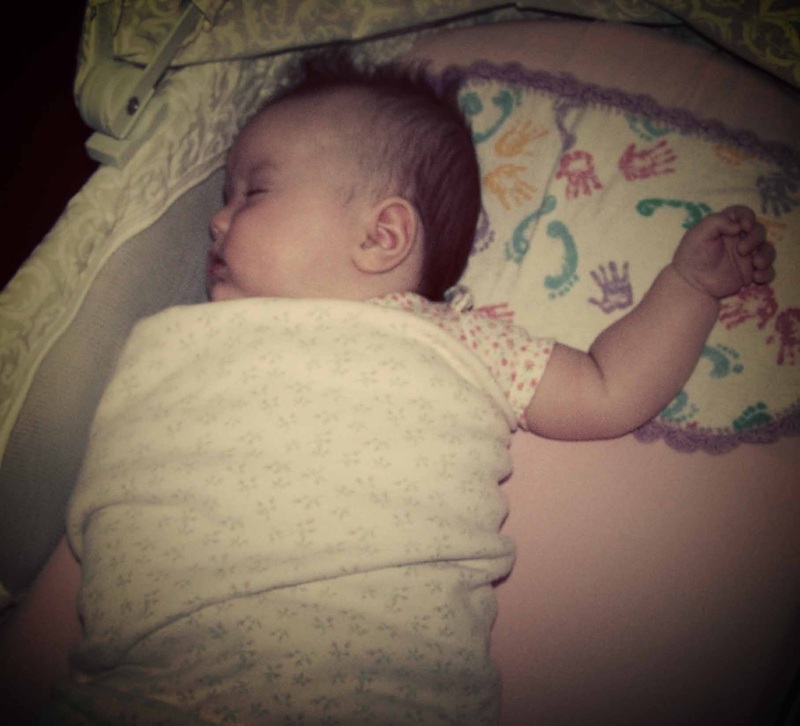 I start on the third (or last) nap with two arms out of the swaddle. I still swaddle the trunk of the baby’s body. If the nap goes well enough for my liking, we continue on with this for a week. The next week, I leave two arms out for the last two naps of the day. The test of this nap, again, is that baby needs to make it through a transition (the 45-60 minute mark into the nap). I leave one arm out for night sleep. If things go well, then we are done! With Kaitlyn and McKenna, once we started the one arm out, things progressed smoothly through the weaning. With Brinley, she did well with one arm, then when I tried two she was not happy. So we waited two weeks or so until she started getting upset and we moved on to having both arms out. You can definitely take this method faster than I do if your baby is able. You could take it to every few days you change, or you could do it so all naps are one-arm at the start, wait a week, then do night, wait a week, then all naps both arms out, etc. Tweak the idea to fit you. There are many items out on the market that help baby transition from swaddling. Two examples are the Zipadee Zip and Baby Merlin’s Magic Sleepsuit. Many people love, love, love these products. I would find them very helpful in a situation where your baby is rolling while swaddled but isn’t really ready to sleep without a swaddle. I considered these products for Brinley since she was getting older and still wanting to be swaddled. I thought it could be a good transition item. It definitely could be. If she was my first or second baby, I probably would have gotten one because I could use it later. I couldn’t justify spending the money, though, when there was no real need for us. It would have been something else to transition out of in the future. So I decided to stick with the swaddling until she was ready to drop the swaddle altogether. Another popular method for dropping the swaddle is cold turkey. This means you just take the swaddle away one day and don’t look back. Many people find with this method that there are 3-7 days of rough naps and night until baby gets used to it. Some people do some combo of these ideas. Some start weaning slowly, and then move to just finishing the process cold turkey. Always trust yourself in what you think your baby needs. Try it, if it doesn’t work out, tweak it and move forward. If you suspect your baby is ready to drop the swaddle, don’t be afraid to give it a try! If it doesn’t work, swaddle her back up and try again when you think she might be ready in the future. And again, don’t stress about it. Your baby will drop the swaddle when she is ready as an individual–on her own time table. This is a great post. I can't remember when I did this with my older daughter (mommy fog)so this was a great reminder. My almost four month old has been sleeping consistently through the night and has recently been waking up randomly throughout the night. I think I have discovered it's because she wants to move her arms! I'm going to try and wean her off the swaddle and see if that makes her happier! Ugh! This is so timely for me. My 4 month old has started to roll to her tummy fully swaddled, yet when we tried to drop the swaddle cold turkey it was a miserable night for her and us. Couple this with her having her first cold. We've started "strapping" her in by using a sheet wrapped around the crip (at the suggestion of her pediatrician!) However, she still is waking up multiple times. I guess we were spoilled that the week before all this she had finally started sleeping 12 hours and dropped the middle of the night bottle. I feel like we've taken major steps backwards and just hoping and praying we will get back to where we were. I did the swaddle weaning with my son, also, and it worked very well. What do you do when you're done swaddling? Just put them to sleep with no blankets or anything? I did the torso swaddle with both arms out for months because he was done swaddling but I felt weird putting him in there just with nothing. Eventually I started putting him to bed in a sleep sack/blanket and that's working nicely. I like to have something on me when I sleep, so I did for him. I just wondered what other people do; no covering at all when they're done swaddling, or what? Both of my kids LOVED to be swaddled. My daughter was happily swaddled until she was 6 months old when she began rolling over in the crib. My son began to be too strong for the swaddle to adequately hold him. I found cold-turkey worked the best for us. It made for 1-2 bad nights, but after that, they seemed to get right back to their old sleep schedule.If anyone is wanting to extend swaddling (like for our son, a month or two he was so strong he would break out of the swaddle, but couldn't sleep without it – I know, weird), we used the Miracle Blanket: http://www.target.com/p/miracle-blanket-baby-swaddling-blanket-beige/-/A-11027864?ref=tgt_adv_XSG10001&AFID=Google_PLA_df&LNM=%7C11027864&CPNG=Baby&kpid=11027864&LID=PA&ci_src=17588969&ci_sku=11027864It hold baby a lot tighter than normal swaddlers. My pediatrician also recommended double-swaddling with my daughter since she went SO long needing to be swaddled. We did the miracle blanket and then a summer sleeper around that. Worked great. Kathleen You will! Hang in there! Danielle — I really loved that comment!And lol–there are always challenges with each age. mrs.enright ,That would probably depend on your child's age exactly. I am like you–I like to have something on me when I sleep. So I always have my babies in something (well, except for Kaitlyn because she really did not like to be warm when sleeping–she still doesn't). I put them in sleep sacks until around 7-8 months old.I just moved Brinley into warm footed PJs–even for naps. I just slip her into them right over her clothes. It is like a blanket but she can move around in it better.I gave Brayden, Kaitlyn, and Brinley a blanket. I don't remember for sure if I did McKenna at this age or not–I think not but I am not positive. Unkown–thanks for sharing your experience! Looking for some advice for my 3 month old baby boy. We are swaddling and he is a really good napper and sleeps great for naps. At night, he usually goes 7-9 hours before he needs to eat, but he oftentimes wakes up one or more times during the night being fussy. If we give him his binky, he goes back to sleep (sometimes for 15 mins, sometimes for hours). If we just let him cry, he will cry for over an hour and he ends up breaking out of his swaddle so it's all over his face and arms. There is no way he will sleep like that. So I don't know what to do! I am doing a double swaddle too. Should I try stopping the swaddle? Should I stop at night only? Should we just keep giving him his binky? Help! Thanks! Haley,The trick will be to figure out why he is waking up. Is he waking up because he needs the pacifier to sleep? If so, you will have to addrses that. Is it that he is hungry? If so, you address that. Is it that he wants to not be swaddled? Address that (though honestly from what you wrote, my first guess is he needs the pacifier to sleep and second guess is hunger, and it might be some of each on different days). I have a 9 week old little boy, will be 10 weeks on Saturday. I am personally just tired of the swaddle because I would like to be able to just put him in the crib, but it is a disaster when I try with no swaddle with an early wake or I tried a one arm swaddle that didn't do well either. Should I just leave this issue alone and swaddle him or how do I wean him off of it? hey valerie, so if that third nap is in the swing since its only an hour or bit more, would you still start at that nap?and if the transition needs to be started because baby is rolling onto tummy while swaddled, would you still do a slow transition? I need some HELP!My 6 mo old son has started to roll over at night swaddled. He usually breaks an arm or two out so I haven't been overly concerned about that. However, during his second nap he refuses to be swaddled. He just keeps breaking free and fighting it! Then, he gets overly tired and won't sleep for the rest of the day-Which is not good! Obviously I need to break the swaddle. I have tried, but he rubs his face and pulls his hair when he is tired and won't fall asleep. Any tips?! Help!! Too young not to swaddle. I have three kids-all Babywise! I swaddled my first two and did the weaning just like you suggested above. They were around 3 months when I started one arm out and we slowly progressed to two. My third is 7 weeks. I KNOW she's too young to no be swaddled but she's big and strong. I have tried muslin blankets, halo and woombie. She can get an arm or hand or both arms completely out. If she even gets her arms away from her sides she keeps herself awake trying to get them out. She can't sleep unless they are down by her sides and it's impossible for her to move them. In the woombie she puts her hand in her mouth thru the woombie and is mad the whole time. She even eventually gets one hand out the top. In the halo, she squirms and squirms when you first lay her down but as long as her arms stay down she goes to sleep fine. She ALWAYS wakes up at the sleep cycle change 45-60 min into the nap. If her arms are not down by her sides then she fusses quietly getting her arms up and if they move at all she stays awake trying to get to them for about 30 minutes then starts screaming (overtired). I have let her CIO and she went back to sleep but by then she really needs to be woken to eat. When her arms do not get to her chest she sleeps through the cycle change. She might make a few fuss noises at the cycle change but goes back to sleep. The biggest problem is suddenly is impacting her sleep at night. She's waking and fighting it and getting an arm out too. And this spirals into then I feed her MOTN which makes her first feed stink which makes her wake up early hungry at the next cycle and ultimately overtired bc she didn't take a full nap bc she woke early hungry etcMy question is do I keep fighting this swaddle battle? Or is it possible for me to drop it and expect sleep? If I drop it how should I drop it since she's so young. I am so exhausted this go round. Kelly, I would actually guess this isn't about the swaddle. For some reason, she is sleeping fitfully. One common reason for sleeping fitfully is the waketime length being too long. It could also be that she is having gas pain or reflux pain. If you can get her to sleep calmly, you can get her to stop fighting the swaddle so much. Thanks! I wondered that too. It's so hard to watch her closely for sleep cues and be timely with the other littles distracting me too. She does have reflux–she is on Zantac. She is gassy allllllll the time. No matter what I do I have hyper let down and it makes it hard for her to eat. Anyways. How long is an appropriate wake time for her age? I felt like my first one (angel baby) had much longer wake times already. 50 min? I so admire you and wish I was half the mom you are! You are sweet! I am sure you are an awesome mom :)Have you ever tried pumping for a bit before you nurse? With hyper let down, a lot of moms find success with pumping, letting the let down happen, and then nursing baby once the major spray is done. On the other side, you can use a product called "milkies." It catches the let down. For waketime length, probably anywhere from 40-60 min. And it can vary from wake time to wake time. Usually, the trend will be shorter in theorning and longer as the day goes on. I would focus on the letdown and reflux/gas. Do you do gas drops and gripe water? Those can help. Chances are if you get those taken care of, the rest will be easier to do. It is hard to tell of a baby who is in pain is tired or not. I know that it is not supposed to be possible for a baby to get "addicted" to the swaddle, but it really seems like mine is. He is 10.5 months old and refuses to sleep without it. I have tried weaning, using every method, multiple times and he will not go to sleep. Most recently, I tried the one arm out for a nap thing and after 25 minutes he finally went to sleep (it normally takes two minutes or less). I was so excited. My excitement was short lived. He woke up screaming after only 30 minutes (he normally sleeps for 1.5 hours at this nap). I soothed him and hoped he would fall back asleep but he continued to cry and would only go to sleep when I put his arm back in the swaddle. He is big enough and strong enough that he can roll back and forth and all around his crib fully swaddled. What should I do? I know 9 months is supposed to be the oldest a baby is swaddled and we are well past that with no signs of improvement. At this point, do you think it's possibly that he just isn't ready and I need to keep trying until he is or do we maybe just need to go cold turkey? Thanks for your help! I don't know. On one hand, I say it is fine to continue the swaddle. But on the other hand, he is old. I know many people have said it took a few days of rough naps for their baby to get used to it and sleep well without the swaddle. The rolling around is what would make me want to work on dropping it. He has shown himself to be stubborn so we probably do just need to tough it out. Thanks for responding, your blog has helped me so much! this was helpful! We did a very similar transition. Our LO loved to be swaddle but we stopped when she was rolling over because of safety concerns. We transitioned her into the zipadee zip and it was truly a lifesaver. She slept so well in it and it gave me the peace of mind knowing it was safe for her! Hello! I think my LO is ready to drop the swaddle but we have been dealing with the 45 min intruder for the last 3wks. At first, I handled it as a growth spurt (he was 12 weeks) and evetually after about a week, he quit eating well when I would get him up. Anyways, I can tell he trully dislikes being swaddled now. He fights us on it every time he goes down. When I leave one arm out, he is still waking up within the 45min window. I guess my question is, how do you deal with 45min intruder and baby who really dislikes the swaddle and you want to wean them from it? He is 14wks now. I understand about waiting out the 45m intruder right now with this age and he will fall asleep on own when put down for a nap. I continue to work towards waketime, etc to help with the intruder, but my gut feels like partially why he sleeps so fitfully is because of the swaddle. I just don't know how to handle it with the intruder problem. Thanks! Maybe cold turkey is sometimes best, if gradually moving away isn't getting results. My LO is 15 weeks old. He is strong! He usually doesn't break out of the swaddle during naps, but he is starting to every night. He doesn't like it when his arms come out. He flails all over the place. We tried the zipadee zip and it didn't work very well for us. I think he's just to small yet to feel confined enough in it. He is starting to fall asleep on his own for naps. Just a few minutes of crying usually, sometimes no crying at all. At night he falls asleep while I'm holding him because he has reflux and I have to keep him elevated after eating. The crib wedge just wasn't enough for him. I'm concerned about him breaking out of the swaddle because of the loose blanket being in the crib. I can usually re-swaddle and he'll go back to sleep. He's not rolling over yet, but during playtime he can get onto his side pretty good and then he falls back. When we tried the zipadee zip, this would wake him. It's like he doesn't know he can lay still!! I'm not sure if he's ready to drop the swaddle or not. He sleeps so much better with it. Any advise would be appreciated. Thank you! We are trying to kick the swaddle because our lo, 19 weeks, has flipped over from her back to front one time during a nap in her halo. I used the swaddle me small with a flannel swaddling blanket over it to prevent her from flipping again. We bought the merlin magic sleep suit and waited until the weekend to try it. She is having an ok time falling asleep in it but always wakes up at the 45 minute mark and is having a hard time soothing herself back to sleep. We are still swaddling at night. We have tried letting her cio to go back to sleep after the 45 minute mark and we have tried going back in and putting her back down like it is the beginning of the nap and nothing is working. Her first nap of the day was always 2.5 and then the 2-3 naps after that were always 1.5. We have been dealing with an overtired baby for two days. How long will it take for her to adjust? At what point do we just keep swaddling and try again later? My sister said she would continue to swaddle past when they rolled and then they would just sleep on their stomachs swaddled. I know that method is a "hazard" but I am willing to do anything since she is not getting good naps now.